You will find here sound samples for many records, marked by a small grammophone icon. Just click on the icons to listen to the samples. After collecting vintage 78rpm records and gramophones/phonographs over many years Andreas Schmauder and his wife Maria Kurz have installed their vintage record trading company for all impassioned collectors. 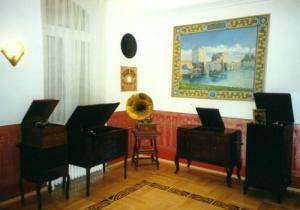 Situated close to Freiburg im Breisgau PHONOPASSION is one of the most important trading houses of its kind in Europe. PHONOPASSION mainly works as a mail-order house but visitors are warmly welcome. On 150 square meters you will find a choice of more than 200.000 vintage records from the gramophone era (1890-1960) and a small selection of historic record players and radios. What do we supply ? PHONOPASSION offers the first and only complete discography and recording history of the famous a capella vocal group COMEDIAN HARMONISTS and their successors for sale. How can I buy at PHONOPASSION ? Besides of those 200.000 records available at fix prices in our sales/showrooms, we offer about 5000 records in our annual auction lists to the highest bidder. 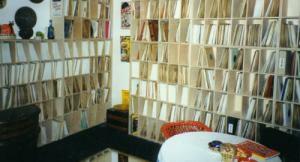 Sale by auction list has been one of the traditional ways of selling in the record collectors world for over 50 years. Early in the year we present a list of classical music, in late summer the auction list of all other fields of vintage record collecting is mailed to our customers. While the auction is running (at least 6 weeks) the auction list is to be found on our homepage as well. 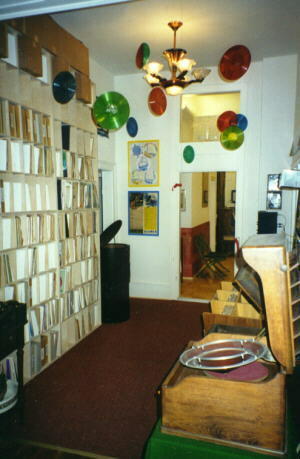 We also offer a small list of records at fix prices is to be found as well which is intended to change after 4-6 weeks. To get on the mailing list of PHONOPASSION, please leave your name and full address on the from to be found at CONTACT. Please mention your wants and we will do our best to offer you the records you like at a fix price. If you wish to get our auction list mailed, please check the type of list required. What else can be found at PHONOPASSION ? In our showroom a small exhibition of historic record players can be viewed as well as contemporary publicity material, needle tins and other phono and recording memorabilia. Exhibition objects are not for sale. Connected to the trading company is an archive of early European jazz/hot dance. The EURO-JAZZ ARCHIVE, containing over 5000 records, tries to gather all recordings of importance for the early history of Jazz in Europe. Focused on recordings of the 1920s and early 30s the archive also documents the whole history of jazz in Europe until the late 50s. The sales/showrooms are situated about 5 kilometers south of Freiburg in the historic "Friedrichshof" a late 19th century Hotel building close to the funicular station of the famous "Schauinslandbahn" (longest German funicular). Coming from the motorway (exit Freiburg Mitte) after about 4 kilometers you will pass a first set of trafic lights and turn to your right on the second lights after about 300 meters. Follow the road through Freiburg-Günterstal until you will reach behind 500 meters driving through a wooden area a small settlement called "Bohrer". "Friedrichshof" is the big yellow building on your right at the main road. Access from the Freiburg railway station is also easy: any tramway direction town center, change at "Bertholdsbrunnen" to tramway line 2 to Günterstal, from the end aiming point a bus line goes to "Schauinslandbahn" or "Horben". This bus has a stop directly at "Friedrichshof", which is situated on the other side of the street.